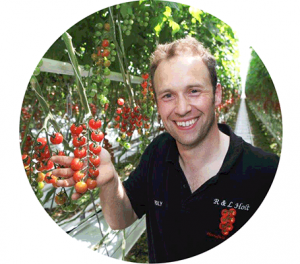 R & L Holt is a family-run tomato growing business in the Vale of Evesham in Worcestershire. Originally formed in 1979 by Rick and Laura Holt, the business now includes the owners’ son and daughter, Roly and Felicity. 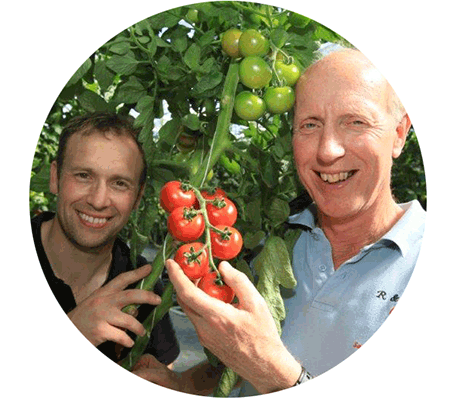 The company began growing tomatoes in the early 1980s. The business has flourished since then and now covers 22 acres over three different sites. The company’s expansion includes building a state of the art glasshouse in 2014; the first of its kind in the UK to use LED lighting. The lighting allows all-year production, even during the winter months. The mains water and wastewater services are currently provided by Severn Trent Water. Rain water that runs off the glasshouse roofs is collected and then stored in on-site reservoirs, which on the largest site covers two-and-a-half acres. The rainwater is then used to irrigate the tomato plants, mixed in varying proportions with mains water according to the age of the plants. Innovation and sustainability are two of the family’s top priorities, and the company has built a loyal customer base by combining top-quality produce with a commitment to environmental responsibility. The company uses its waste water from a septic tank as fertiliser on the site and other efficiencies include operating a hydroponic ‘nutrient film technique’ system. This is a closed system whereby the plants take up only the amount of water they actually need. “The amount of water that the plants use varies considerably from week to week, according to different factors such as the age of the plants and the time of year. We monitor the average usage very carefully,” Rick adds. “It will be interesting to see if the introduction of competition affects how reliable the service is too, and I hope that once there are more players in the market bills might actually go down” adds Rick.